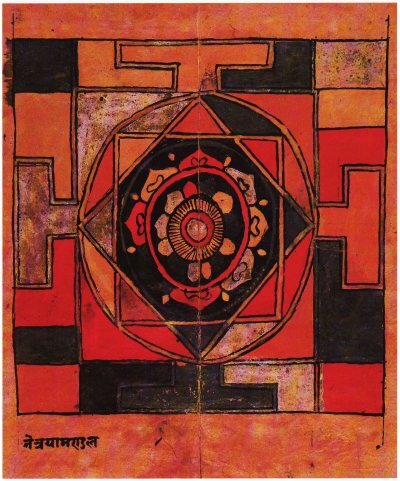 Four yantras (see earlier post) and a diagram from Madhu Khanna’s Yantra: The Tantric Symbol of Cosmic Unity. “Yantras function as revelatory symbols of cosmic truths and as instructional charts of the spiritual aspect of human experience. All the primal shapes of a yantra are psychological symbols corresponding to inner states of human consciousness, through which control and expansion of psychic forces are possible.” (p12). Nepal, c. 18th century (p52). “Each graphic shape can be seen as a psychological schema: the outer gates are the gates of one’s consciousness; the lotus petal, spiritual enfoldment; the inner geometrical figures, the stages of spiritual ascent; and the bindu, one’s innermost self” (p150). “Every symbol in a yantra is ambivalently resonant in inner-outer synthesis, and is associated with the subtle body and aspects of human consciousness. Thus, for instance, the bindu in a yantra is cosmic when viewed as the emblem of the Absolute Principle but psychological when it is related to the adept’s spiritual centre. By aligning these two planes of awareness, the yantra translates psychic realities into cosmic terms and the cosmos into psychic planes” (p22). Sri Yantra, formed by the interpenetration of two sets of triangles, four, apex upward, representing the male principle and five, apex-downward, representing the female principle. Rajasthan, c. 1700 (p112). “Yantra meditation should should not be understood superficially, as though attention were merely pegged on to a symbol, as for instance when we focus on any symmetrical figure to control our mental flux. On the contrary, genuine yantra meditation produces an active mental state and induces receptivity to symbolic revelations” (p107). 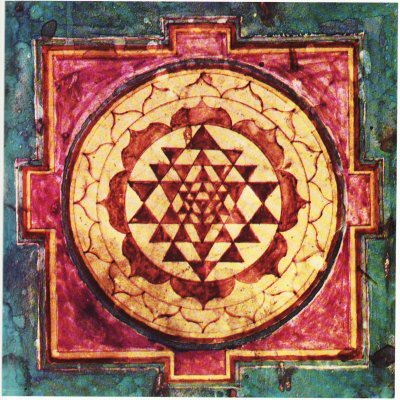 Smar-hara Yantra, the ‘remover of desire’. 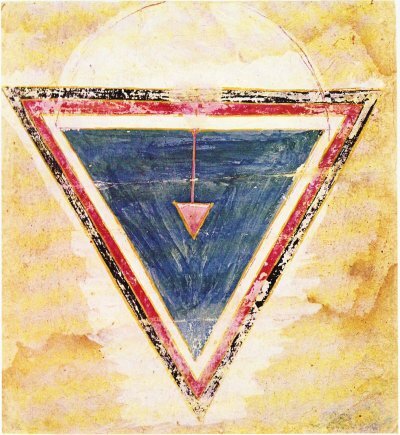 The circle is the latent Kundalini Sakti, which when aroused can penetrate beyond the successive planes of inwardness illustrated by the five male and female triangles which correspond to the five psychic sheaths that envelop the innermost self (p142). “One of the most important rituals of yantra worship is the infusing of vital force (prana) into the geometrical pattern of the yantra, called pranapratistha. 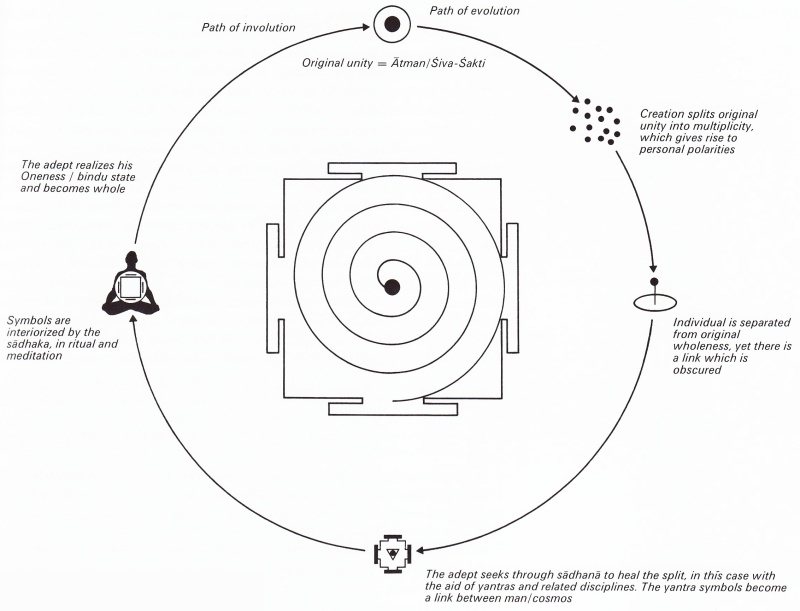 The goal is to cause the spiritual universe underlying myth and iconography to ‘descend’ into the yantra so that it becomes a radiant emblem and receptacle of cosmic power (sakti-rupa), and consciousness (chaitanya), transforming into sacred archetypal space what is phenomenally no more than a mere design. 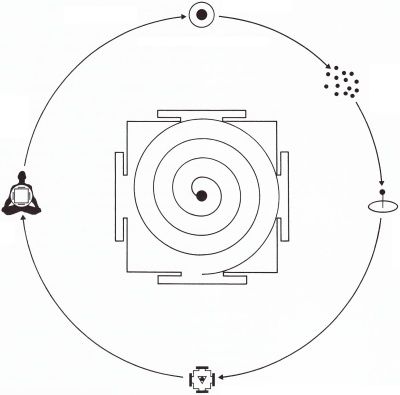 The transfer of power from the sadhaka to the yantra changes the nature of the diagram, and the consecrration of profane space conversely elevates the sadhaka to realizing the inherent energy of the theophany, so that the yantra becomes a powerful means of contact between the sadhaka and the cosmos” (p98). Sakti Yantra. 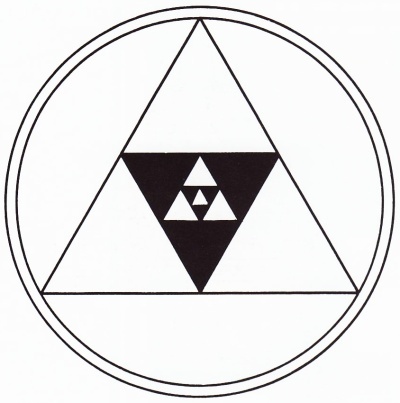 The three sides of the yoni, the primordial triangle, creative matrix of the cosmos, stand for the three qualities composing material nature: sattva, the ascending quality, seen as white; rajas, the kinetic quality, seen as red; tamas, the descending quality or inertia, seen as black. Rajasthan, c. 17th century (p113). “What is counselled is not withdrawal from existence or a cold ascetism which teaches us to sever our links with life, but a gathering up of existence into our own being. This gathering up is effected by cosmicizing the body, and treating it as a ‘tool’ for inner awareness by taming it with yogic rituals, awaking zones of consciousness and activating its latent subtle energies” (p119). The dynamics of psyche and symbol. This process should be seen in relation to the dynamics of cosmic evolution and involution. Click to view larger version with labels (p75). “When [the adept] has internalized all the symbols of the cosmos and his body ‘becomes the yantra’, [he] is no longer alienated from the truth that the symbol illustrates, but is transformed into the truth he seeks” (p80). Wow just found your site in google.. Love your post on The Dynamics of Psyche and Symbol « Unurthed! First of all, where is your reference to Madhu Kana and her book on Yatras where you got all of your pictures? Mookerjee is incorrect I have both books! Second you have missed the mark on what a yantra is! It is a graphic representation of a standing wave pattern. The technology is so old even the instructions are misinterpreted. I can prove that.Even the way the petals are formed is grossly misunderstood and abused to satisfy the ‘god stories’ of long ago. In there proper use, they are a hyper dimensional window for soul’s use to address the higher aspects of self. Example; a pentatope (4-D tetrahedron) when correctly oriented is a pentacle in a pentagon…commonly used by Wiccans. It’s a 2-D representation of a particular orientation of a 4-D platonic solid. True they have been used as symbols for so long it’s not surprising that they illicit an autonomic reaction in most people. Heaven is a stranger place than the one you’ll leave behind….and your taking the long way home! All of the images and quotations are from Khanna’s book (see page numbers), linked in the introduction of the post.